Melanged Magic: Can You Stand Another One? Now that I've 'seen' red geraniums, I'm seeing them everywhere! 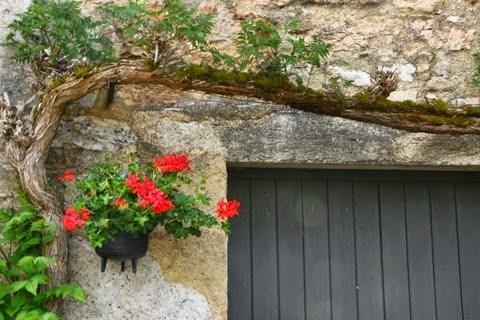 I was in Faycelles this morning to visit an art exhibit and this little pot hanging by someone's garage door tucked on my sleeve and pleaded...'take my picture, please!' So, I did. I hope you can stand one more red geranium photo. I've had a couple of comments from people who didn't realize the iris is the national flower of France. There is some debate as to whether the iris or the lily was the inspiration for the French national symbol, the fleur-de-lis. If you Google it, you can find arguments for both sides of the debate.